The Age of Chivalry is Alive! 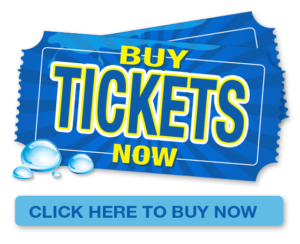 Cheer on your Knight in the 5,000 seat arena of champions. Quite a spectacle, as two tons of horse, knight and armor gallop onto the field, prepared to do battle with ten-foot lances for a lady's honor. Spectators revel in the melee of falls, fights and galloping horses, cheering for their favorite knight until the winner is proclaimed. When the joust is over, stop by and meet your champion and his steed at the arena entry. 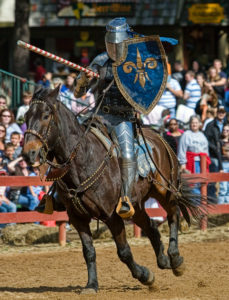 Tournament Jousting is held three times a day in our Jousting Arena! Why did people hold jousting tournaments? They were often held as celebrations – to mark a victory in battle, or the signing of a peace treaty, or a royal wedding. Sometimes they were held during wars, to keep soldiers busy and to train them. Did knights ever cheat? All knights were supposed to believe in chivalry – a code of honor, bravery and loyalty. But some knights did cheat by having their armor bolted to their horses. Others used jousting tournaments as a cover for murder!